GDP means Gross Domestic Product, which is the total market value of all final goods and services produced in a country in a given year. GDP (Gross Domestic Product) is a measure of a country’s production or income. In simple words, it is the sum of all the incomes of the people living in a particular country. It is the value of a country's overall output of the respected goods and services at market prices. The GDP does not include the net abroad income. For instance, the GDP of US is $15 trillion. 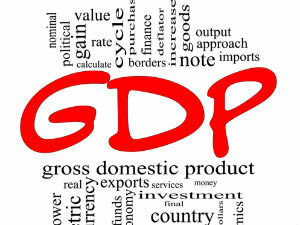 The GDP is one of the simplest & intuitive measures of a country, which tracks its economy and the net imported income. It helps the country to find its economical progress and development. Usually, GDP is expressed as a comparison to the previous quarter or year. It primarily indicates and reflects the health of a country. A country’s recession wholly is dependent on the GDP of the country. GDP is generally shown by representing on a Graph. The GDP is basically measured as: Y = C + I + E + G.
Where, Y= GDP, C= Consumer Spending, I= Investment made by industry, E= Excess of Exports over Imports, G= Government Spending. Net Value Added = Gross Value of output – Value of Intermediate Consumption. Total factor income = Employee Compensation + Corporate Profits + Proprietor's Income + Rental Income + Net Interest. GDP (Y) = Final Consumption Expenditure (FCE) + Net Exports (X – M).